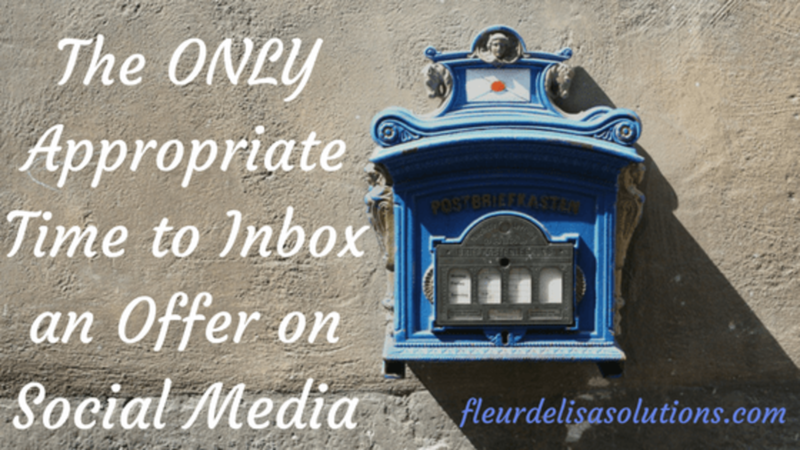 Is it ever really okay to inbox an offer to your social media contacts? The short answer is yes, there is an appropriate time and way to inbox that offer to someone. But the truth is, the right way is NOT usually what happens. So let’s start by looking at what really happens on social media and exploring why it may not be the best way to get sales or clients. We’ve all experienced this personally. They don’t know you, they are not even a connection in your social media list, but somehow they found their way to your inbox – usually that “other” hidden folder. In fact, many of you may not even know those “great offers” are sitting there waiting for you! Yes, this person is persistent, bold, and has no concept of what it really takes to build a solid sales foundation for their business. They will try anything to make a few dollars and they don’t really care how bad or desperate it makes them look. They are going to “get their share” any way they can. The problem is, SPAMMING DOES NOT WORK! Sure, you may get a few unsuspecting or uneducated folks bite, but the sales will be inconsistent, at best, and you surely won’t retain these folks as repeat customers. That is unless you want to put in some actual work to retain them. You will need to work at building a relationship with them and EARN the trust it takes to get repeat sales and loyal clients. This is the one that makes me want to send this blog post to them. If you have a business online, chances are you receive regular connection requests on our social media platforms. Let me start by saying you definitely should be making connections on social media. "Building a solid network is vital to your business." When making connections on social media, it is very important to spend time building a solid community. This means you have to work hard to build lasting relationships with those you connect with. I know you have heard this time and time again. 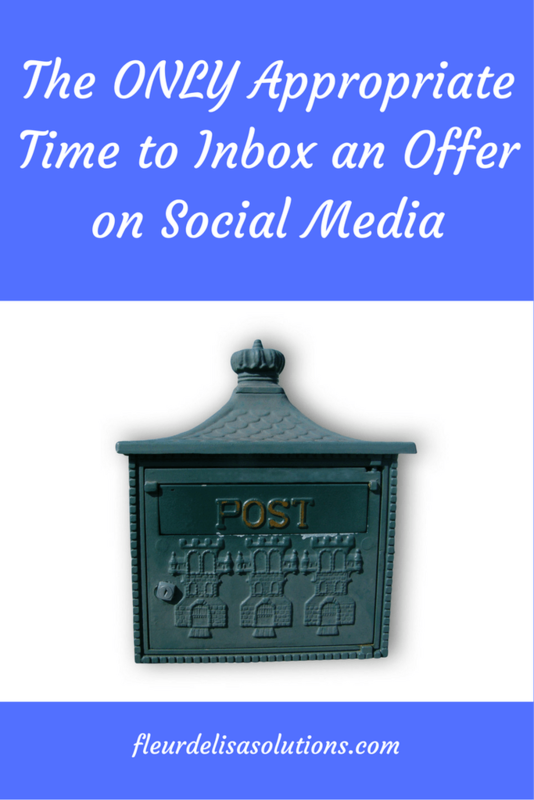 However, the immediate inbox offer is still alive and well, and fairly rampant on social media. Consider this: You walk into a party, walk up to the first stranger you meet and try to sell them whatever it is you are selling. Would you do it? What do you think their reaction would be? Do you think they would buy? Well, they are at a party and they came to have a good time, not to be sold. Plus, NO ONE likes to be sold – especially by a stranger! Remember, when you connect with someone on social media, you are a stranger and they are NOT on social media to be sold. When you connect with others on social media, you need to spend time getting to know them through their posts and through your posts they interact with. Unless you do this, and invest the time to get to know them, you will remain a stranger no matter how long you have been connected. Social media means you actually have to be social. You need to “talk” to people and build relationships. If you feel like you need to inbox a new contact, NEVER send them your latest sale or to your website. It is presumptive and rude. It is okay if you want to thank them for the connection and let them know you look forward to getting to know them better, but leave it at that. "Make it about them, not about you." You may have heard of these, or maybe you have been the recipient of this type of offer. From what I have seen, many health and fitness folks use this method. The problem with this is twofold. First, unless you REALLY KNOW the person is interested or they have expressed interest in your product or service, you are making a presumption with no facts to back it up. And second (and this is the one I have seen WAY too often), some folks target inbox people they perceive to be overweight or unfit, which is downright insulting to the recipient of the inbox message. This is why it is so important to actually build the relationships and get to know the real needs of your connections. People buy from people they know, like, and trust. When you send an inbox message that can potentially insult someone, you probably just destroyed the like and trust factors. Once you have invested the time and made an effort to get to know new connections by engaging with their content or them engaging with yours, they may have gotten to know you better. They may like you and even trust you. IF in the process of getting to know them you learned they may have an interest in what you do then, and only then, should you inbox and offer to someone. The thing is, most folks will probably not be your potential client, and building those relationships takes time. People will buy when THEY are ready, not when YOU want them to. These are just some of the reasons a better alternative to spamming people on social media is to get them on your email list. When they sign up for your email list, you have earned the right to stay connected to them and build the relationship necessary to make those sales. If they are on your email list, you can email offers to their email inbox instead of spamming them on social media!But again, don’t only email your list when you are selling something. ALWAYS provide value in your emails through education, tips, or humor. This is a must if you want them to stay on your email list! I know you want to be a savvy business owner and do things the best way possible. You can build and maintain a great reputation by doing things in a way that respects the integrity of others and your own business. Taking the time to know your audience and value them will help establish you as a business owner who they truly want to do business with! If you are still unsure of how to grow your network, build those relationships and move them toward buying from you, I offer strategy calls on a weekly, bi-weekly, or monthly basis on retainer. If you need that little extra push or advice, I welcome you to schedule a 15-minute introduction call to see how we can work together.